There are no border controls when you drive into Switzerland on the highway. There are, however, armed officers checking for your annual highway pass. Forty euros ($48) later you are the proud owner of a sticker allowing you 12 months of access to the Swiss highways. Less than a buck a week is pretty reasonable, but since this was going to be our only venture into Switzerland for the year and we were driving straight across to the Stelvio Pass it worked out at about $12 an hour - cue outrage. Within a few miles that outrage started to fade as our route, that passed not far from BMC's HQ, took us along the floors of Alpine valleys beneath jagged ridges and peaks linked by stunning tunnel after stunning tunnel. My Lord, the Swissies know how to run a highway through high mountains. That sticker shock? On a per hairpin-avoided basis the $48 was looking like a reasonable investment. In BMC red the SLR01 does not blend in. While Swiss watches are the usual benchmark of precision craftsmanship, it was those tunnels that came to mind three days later riding BMC's top-of-the -range 3rd generation Teamachine SLR 01. The SLR01 is not a delicate piece of jewelry, it is an amazing piece of engineering designed to translate effort into speed. My Lord, it's good and, of course, it should be. It is a bike designed for Grand Tour GC contenders. BMC takes great pride in informing the world in the first line of its description of the SLR01 that riders using its earlier iterations have won the Tour, rainbow stripes, Olympic golds and Classics. It is also four quarters under $12 grand in the form I rode it, with disc brakes and Dura-Ace Di2. That is a price point above the means of all but a few and the sponsored. The Eurobike Media Days in the stunning South Tirol region of Italy was my opportunity to ride the 2018 SLR01 and to say I was impressed is a mighty understatement. This is a bike that managed to be simultaneously rock solid and airily light and responsive. The asymmetric frame accommodates the disc brakes new to the 2018 model. Part of the test loop I rode was a long not-too-steep downhill with a poor surface and a succession of wide cracks running right across it. Despite my lack of time on the bike I felt completely in control hopping the cracks and the bike could not have been more easy. It feels utterly stable under you and unphased by rough road surface -- a perfectly balanced piece of race equipment. I did not come close to testing the envelope of its abilities, but came away with the feeling that the only limits on its performance would be contained by the human astride it. Even I could make it go fast. 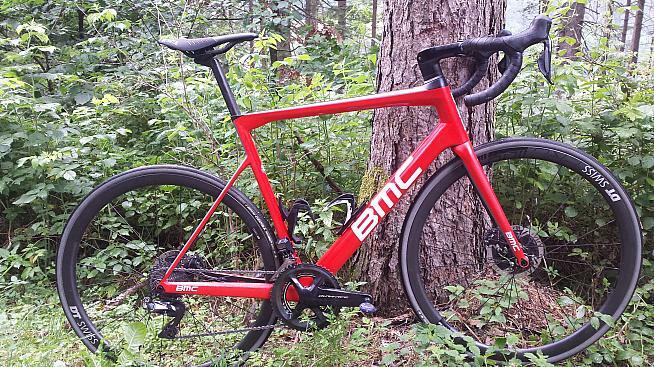 Unlike some really light bikes that seem to leap forward when you mash the pedals the BMC simply seems to reach the desired speed almost instantly. It was most noticeable when spinning up slopes. Up the cadence and the bike just accelerates beneath you. Smoothness is the primary sensation. 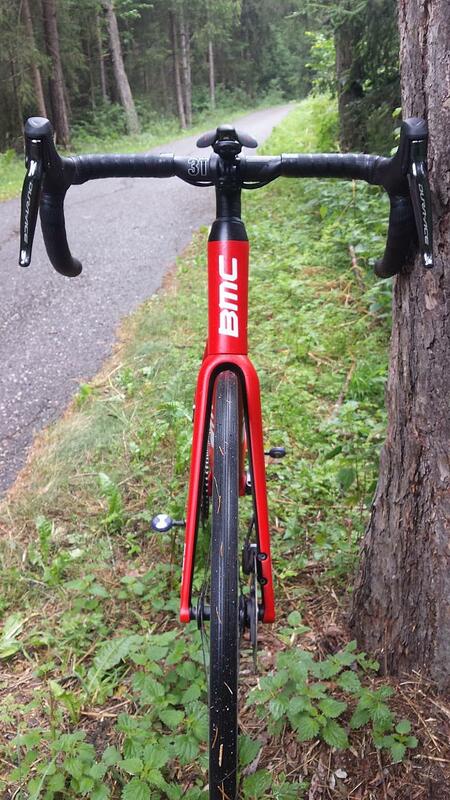 BMC says that its Accelerated Composites Evolution Technology (ACE) is a big part of the bike's performance. ACE's computer modelling replaces traditional prototypes allowing many more shape and lay-up variations to be tried in the same time -- no fewer than 34,000 they claim. The outputs on the 2018 SLR include asymmetrical chainstays, a very wide bottom bracket-downtube-seat tube-chainstays junction for "dramatic" stiffness as well as a wide meeting of top and head tubes. The integrated cockpit is extremely tidy and BMC's DTi set up (Dual Transmission Integration) is a fancy way of saying that whether you are using electronic or mechanical shifting it will work and look good. As always, the more choices for the rider the better. The D-shape of the post and its deliberately long length add comfort. The 2018 SLR offers both disc and rim options all the way down the range with a considerable saving for sticking with the traditional stopping arrangements. Rim brakes with Dura-Ace is $9,499. 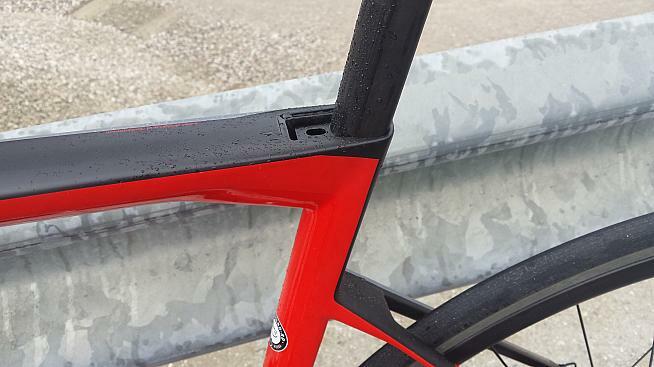 The rim-brake frame is 5g lighter than the disc version at 810 vs 815. Both can accommodate 28mm rubber and come in sizes between 47 and 61cms. 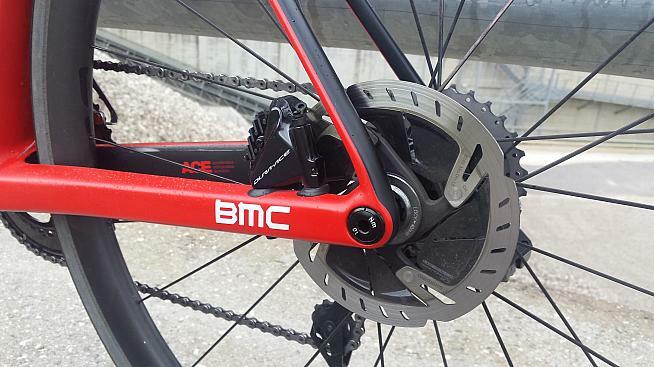 BMC said that they were seeing a 50/50 split between disc and rim brakes on early dealer orders despite the sizable price difference. Looks are always subjective and I was somewhat surprised to realize I found the SLR01 easy on the eye despite the seatstays joining the seat tube well below the top tube, which normally is a no-no for me. And the disc brakes. Apart from the price, which is what it is, the only real criticism of the SLR01 I have encountered is along the lines of "It's a bit soulless, it doesn't make the spirit soar or stir the passions". In some ways the SLR01 is so smooth, so good it strips some of the excitement out of the riding experience. Whether you see that as a good thing or a bad thing will be driven entirely by your worldview. Some people would sell their soul for the Teutonic excellence of a Porsche 911 while others lust for the Italian spirit of a Lamborghini even with its imperfections. The cockpit is beautifully clean and uncluttered.